So this blog has been a long time coming… seeing as I have had the site since the beginning of the year. But between work & a really busy year, I haven’t had the time — or energy — to get it all going. Anyway, welcome! My name is Callie. I am a 25-year-old Califronia girl living in Los Angeles… although sometimes I think I belong in the south, but we will get into that another time. I am the food stylist/photographer and a recipe developer for the website and cookbook company Hungry Girl. It’s a guilt-free recipe landmine filled with TONS of recipes for every craving you could ever have and more — oh and you can eat them and still fit into your skinny jeans. You can find all of the photos I take for the website, (I became the food stylist around fall 2010, so anything after that is done by me.) in addition to a ton of recipes I have also developed for the company at www.Hungry-Girl.com. (And sign up for our free daily emails!!) The job is something I literally fell into. I was a Media Studies/Journalism Major and Film/TV Minor at San Diego State University when I first met Lisa (aka Hungry Girl herself) at a book signing ( I was a HUGE HG fan beforehand) and I didn’t give up until she hired me. I am persistant like that — and I was lucky the job fit me like a glove. The Hungry Girl staff is made up of a small group of incredibly driven, talented, and compassionate women I love to death! Anyway, so that’s my day job, even though I am lucky enough to find it odd that I call it a job because it’s just what I do — which is why I created this blog. I have a passion for food — all kinds — although I love to stick to a low-calorie/fat diet, I do not have any problems indulging in things I don’t get to eat very often. For example, most of us at Hungry Girl are pretty strict with our diets, except for my office mate and best friend — who can eat whatever she wants and still remain stick thin — who will bring in super-fatty baked goods we all try and have just a bite of while she eats multiple! Why can’t that happen to us all!? Anyway, I try not to beat myself up for a bite or two (or twelve) of the decadent sweets she may bring in to us. You gotta live a little right? Through MUCH trial and error throughout my life so far, I have learned how to find a healthy balance for my eating habits — and I want to share my tips and recipes with you all! It’s not an easy thing to master, and while I am no expert, I do find myself coaching friends and family on living a healthier lifestyle. I thrive on workouts (but don’t spend unrealistic amounts of time at the gym) and love to find a way to make seemingly decadent food a guilt-free food! Now, for my first post, lets go back to that point I made about indulging in decadent foods every once in a while — and in moderation. Remember that tiny but eats what she wants friend I mentioned earlier? 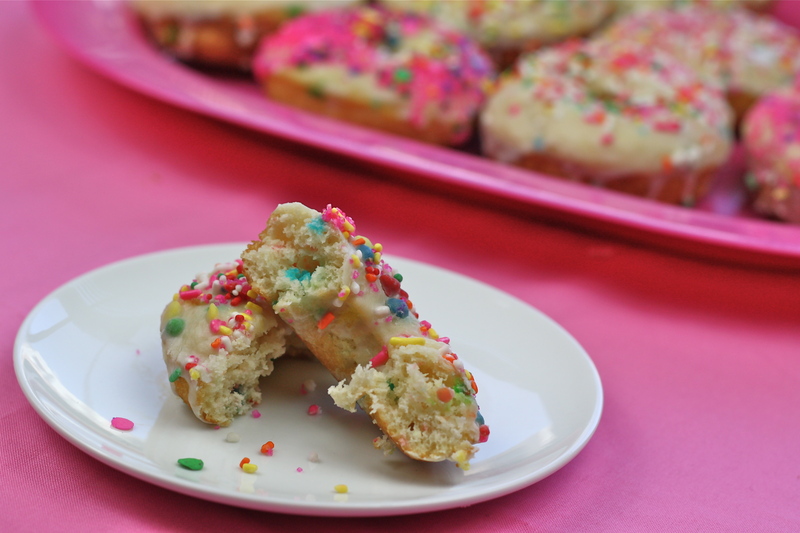 Well her birthday was last week, and in honor of her birthday AND Funfetti Week, I made her baked Funfetti donuts! While they are baked and better for you than a real fried donut — they aren’t something you want to choose for breakfast each morning, but they are one darn good treat! Enjoy!! Preheat oven to 425 degrees. Spray a donut pan with nonstick spray. Beat all donut ingredients together until smooth. Transfer to a ziplock bag and cut one corner off. Pipe donut batter into the pan — filling each about 2/3 full. Bake 7 – 9 minutes until lightly browned and tops spring back to the touch. Let donuts cool 5 minutes. Turn pan over to release donuts. Put frosting into a wide bowl and microwave 30 – 45 seconds, until softened, but not completely melted. 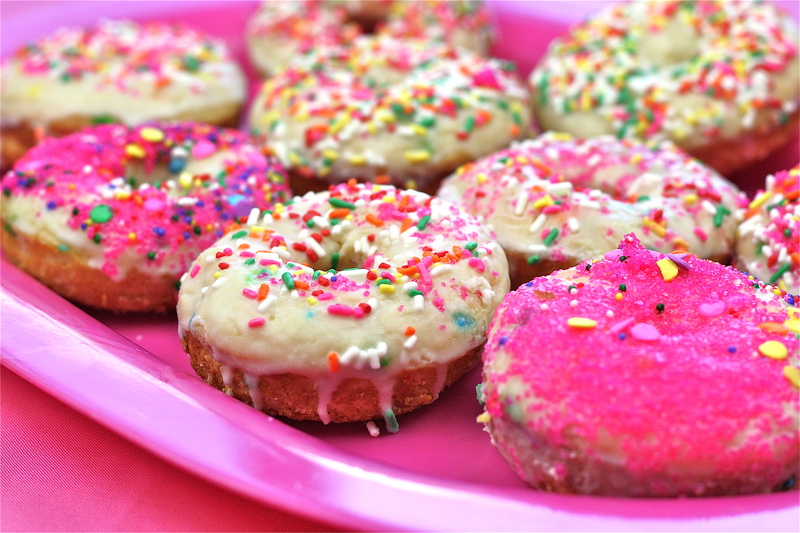 Place sprinkles on a plate. 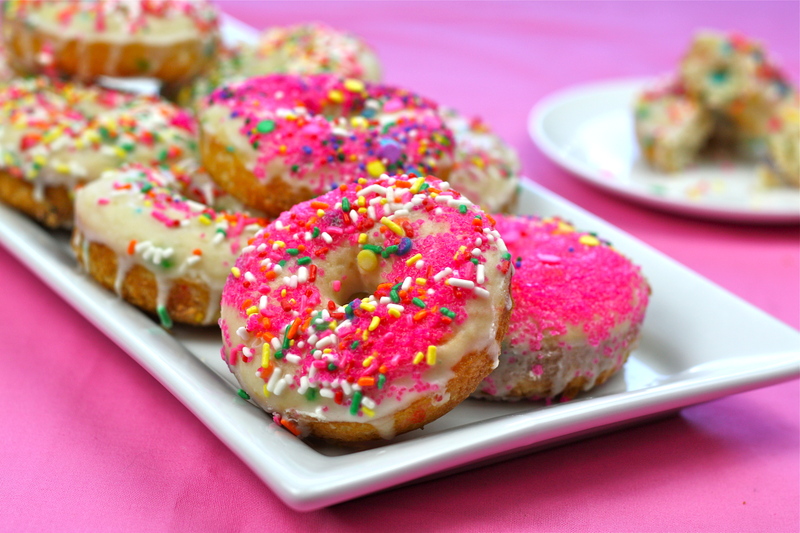 Dip each donut into frosting covering one side and dip into sprinkles. Continue with all donuts and let them cool and set. Then eat up! * nutritional information calculated with entire cup of frosting and 3/4 cup sprinkles, although neither may be used in full. Those look so yummy Callie! Great job! I hope you don’t mind, I had to Pin it! nomnomnom thanks so much, these were DELICIOUS!!! Thanks Erika! Are you an HG fan as well??? Omg huge. After finding her baked butternut squash fries recipe, I make it all the time! And she turned me onto shirataki noodles, which I loooove. My favorite is sauteeing the noodles with a little parmesan cheese, salmon and peas or corn which might sound weird, but I love it. Her site is great! Hi! Saw your link at Cookies & Cups when I was over there commenting a minute ago. 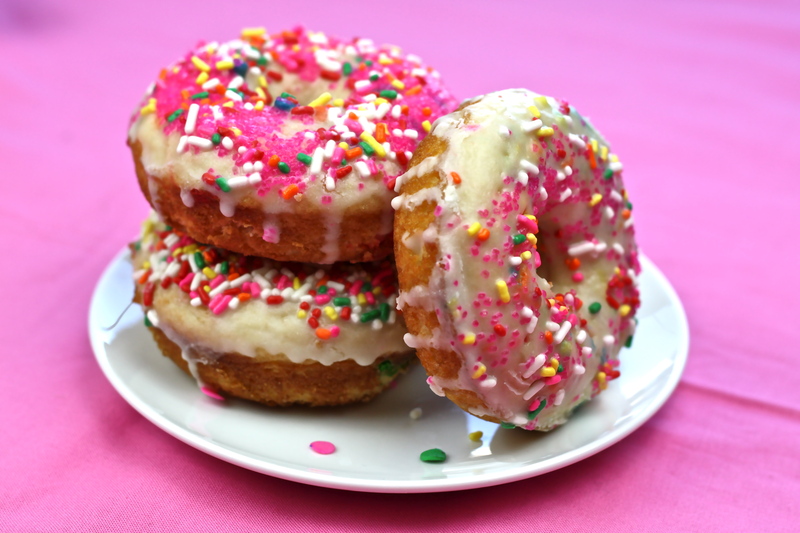 I use the donut recipe and love it. I saw this was your first post so I thought I’d say welcome to blogging! My blog is actually newer than yours, I took a few years off and just started back and love it! Hope you’re having fun with it too!